In 1976 while on Holidays in Gaoth Dobhair in Donegal, I went nightly to sessions in Hiúdaí's bar. The high humidity always slackened the skin and made it unplayable. When I got home I sought to remedy this. 3 months later at a session in Ballinascreen I met up with an old friend, Joe Diamond who was playing a banjo that he had built. While I was examining it I got the idea for solving my problem;- a moveable internal tone ring. It was the exact opposite to the tuning system on the banjo, where the mechanism pulled from the outside. Mine would push from the inside. A week later I was playing it. 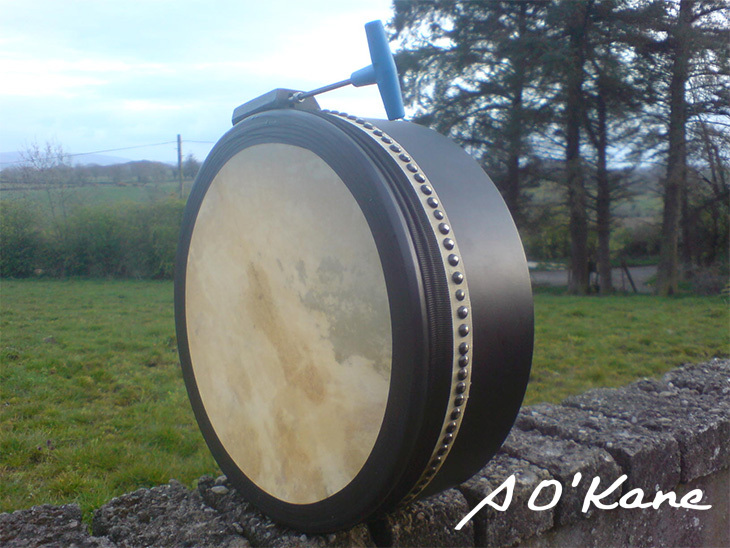 This idea was to destined to change forever bodhrán and hand drum making worldwide. That was late 1976. For the next few years nobody noticed this inventive step, except for a few local bodhrán players, mainly Gino Lupari, and some others who saw it either in Donegal or at fleadhs. It never ever occurred to me that it was such an important idea. To me it was a private solution to a private problem. At this stage, rough though it was, I had answered the problem of tensioning the skin About 1981-3 other makers began to notice and refine the idea and, had they not, then possibly the idea would have remained unnoticed. To see my idea being copied gave me a sense of great pride. 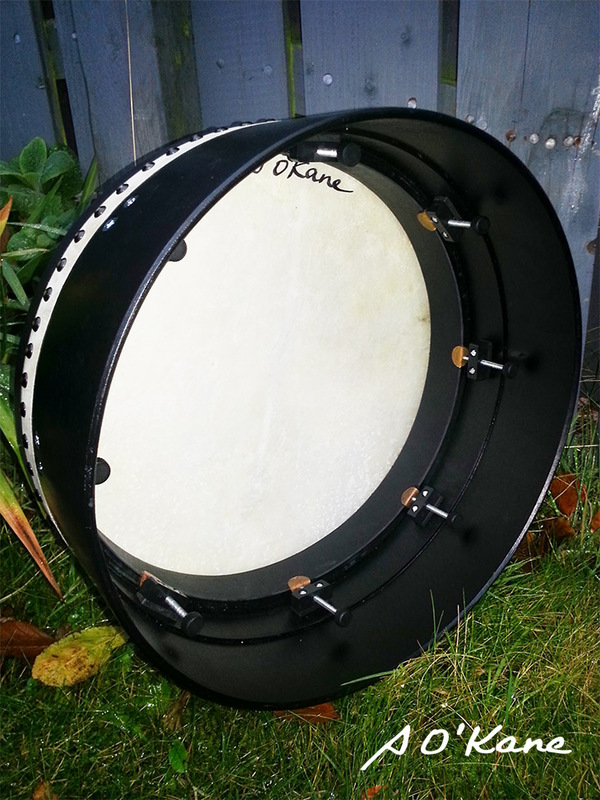 Initially the idea that such an ethnic drum design should be tampered with caused annoyance amongst other big makers. Progress gladly prevailed. 2. George McCann’s design - split shell type. 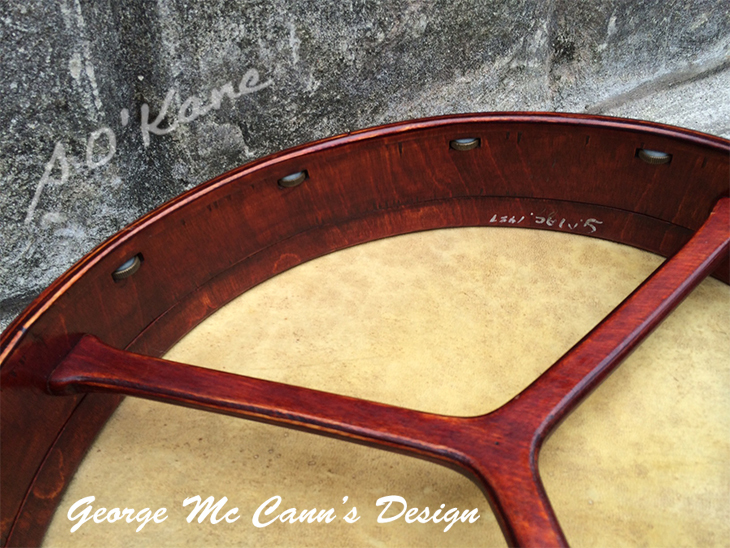 About 2 years after I made the first of my tensionable type, George Mc Cann from Cookstown in Co. Tyrone made a bodhrán for his wife Teresa. 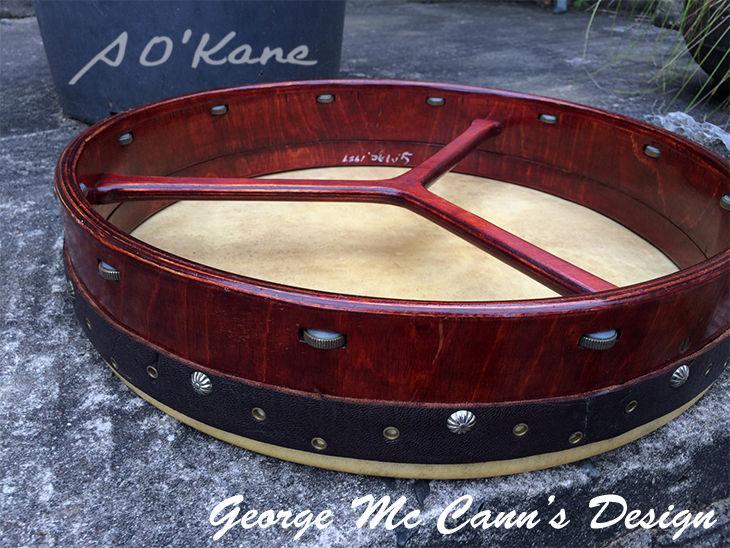 In my opinion his idea was the single biggest inventive step in bodhrán development and sadly unnoticed by other makers, since George was such a private person. Over all these years I have watched with interest, other makers reinventing honestly his idea, but always falling short of what he did. Some got so close, but only within these past 4 years has the idea been recreated/reinvented to his standard. I write this in recognition of George’s achievement and so that such a quiet, modest man gets credit for his work... without belittling those who now make the same idea. The problem of skin tensioning was answered but the problem of moderating the sound was not. Drums still sounded unacceptable loud and rough. Most makers were well aware of this problem and many players had their own solutions. How or what moderates the sound? Throughout this period of about 7 years I had examined any research papers that I could get from whatever culture. I tried; sheep skins, deer skins, dog skins, calf skins and of course goat skins. For cures; animal piss and manures, alum powder, lye, oak bark, oak bogs, lime, tallow, industrial ammonia. Basically the process is; apply whatever curing medium to the skin both sides leave for a period of time from 6 to 40 days, rub off the hair and wash thoroughly, stretch the skin onto a flat plate of wood to convert it from goat/animal shape to flat drum shape, when dry, scrape to a fine surface and fine finish, both surfaces. Each cure gives a different result. The availability of wood types and glues governed the construction of the shells. Initially I knocked the wire out of garden seives and nailed the skin onto these. Later I used steamed beech and ash and scarved one end, bent it over a round former glued and secured…when dry finished off. When birch ply came onto our market the new lighter shell diameters and depths became possible and the new glues did not need nailed support. By 1980 I had experimented with a variety of shell diameters and shell depths from 21” to 12”…using the same skin as a constant. I had formed the opinion that around 16” diameter suited me best. In a hurry to make a former, Frank Dillon, a building contractor extending our school, gave me a short plank length…and totally by accident, this became my preferred sound diameter. So it can be said that my diameter is a thick as 2 short planks. Depth experiments followed leadi to a maximum depth of 6”…then for practical playing this dropped back to 5.5”. 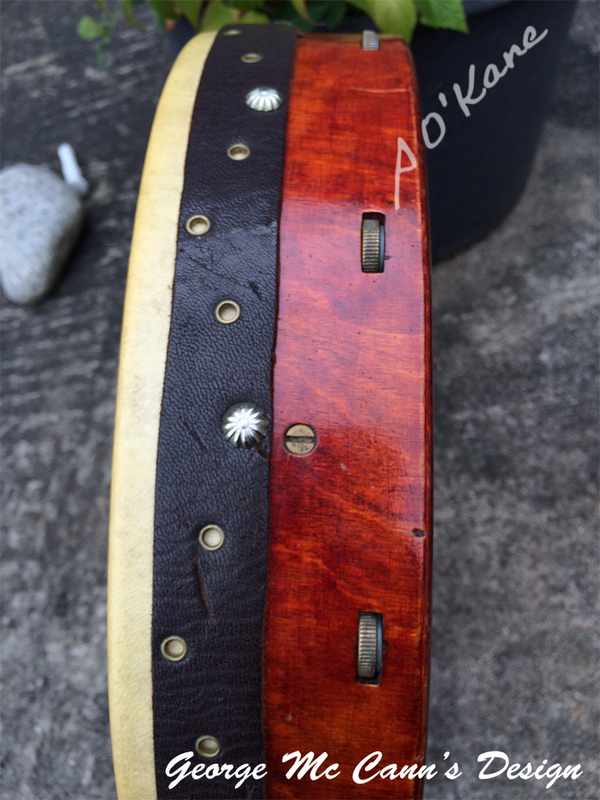 Without going into details all my shell are now built so that they are as a light as possible…the shell is in tension with itself,…and when the drum is finished has more than 70 rivets holding it together so that it is strong and responsive to the skin vibrations. It vibrates with the skin. What I mean by this is moderating the sound to achieve a pleasant range of tones. It was widely accepted from the late 60’s. that thick skins were best. 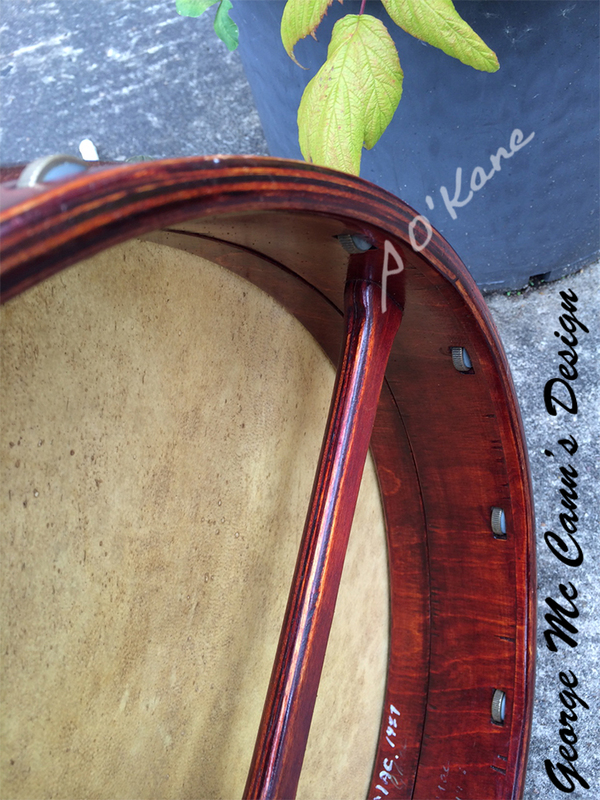 The genral type of bodhran in use had a thick rough skin that gave out the loud rough sound wanted by many players So I set out to make a pleasant sounding drum The skin used for Lambeg drums were very thin compared to these bu were readily available when they burst. Some northern makers availed of this opportunity. Since my preference for shell size was 15.5” the broken heads suited this size perfectly. These skins were absolutely perfect for makers that did not like the oil method of softening the tones, myself in particular. 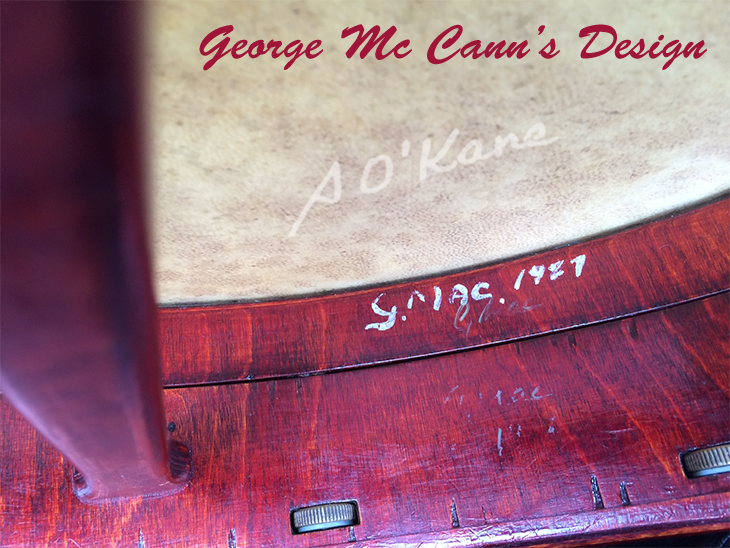 onal changes are made by the position of the hand at the back of the skin…This is what makes the bodhran so special. 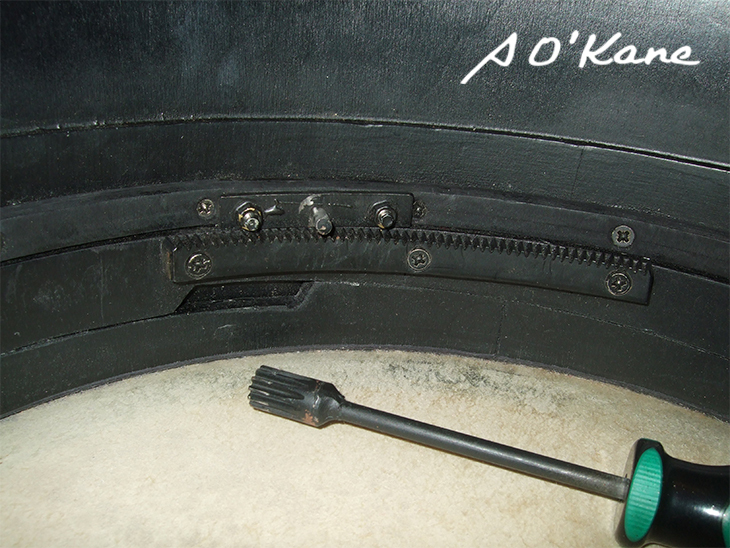 Nearly always, the newly made drum needs its sound moderated before it goes to the player. Method 3: Adding oils and such. The first method is temporary and can be easily altered, so I chose to use this. The other 2 methods are permanent. After about 5 or 6 years of experimenting, I finally settled on the first method…. where I applied duct tape to the outer edge. Johnny Mac Donagh showed that he used electrical tape so I took his advice and have used it ever since. Since it has now become a trade mark of my drums, I keep using this method. It has become a much copied idea thereafter. Blindly copying the work of other people can sadly limit the design progress of sound production, and so the possibilities of method 2 remain, by and large, unexplored. 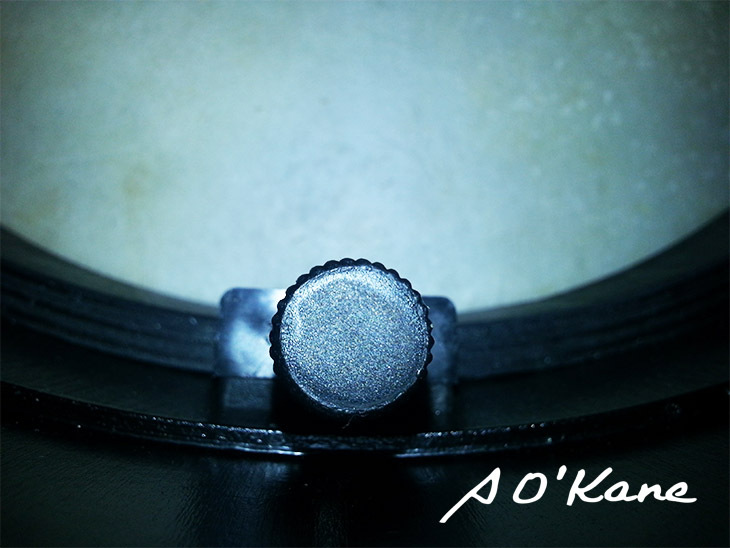 Eventually I learned how to moderate the sounds and so could make every drum a fairly good one. At this stage in the late 1970’s other makers, no matter how good, could never predict their results. 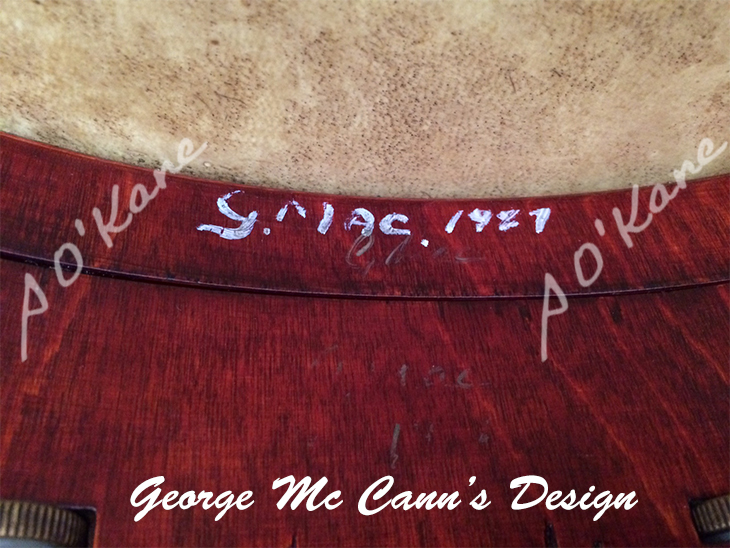 Exceptional makers could achieve about a 30% success rate, the average makers about 5%, and good sounding drums were very rare... and highly prized. (*Note this model is no longer available, and has been superceded by the New Cam Type system [please see; "6. THE NEW CAM TYPE" system, below]). 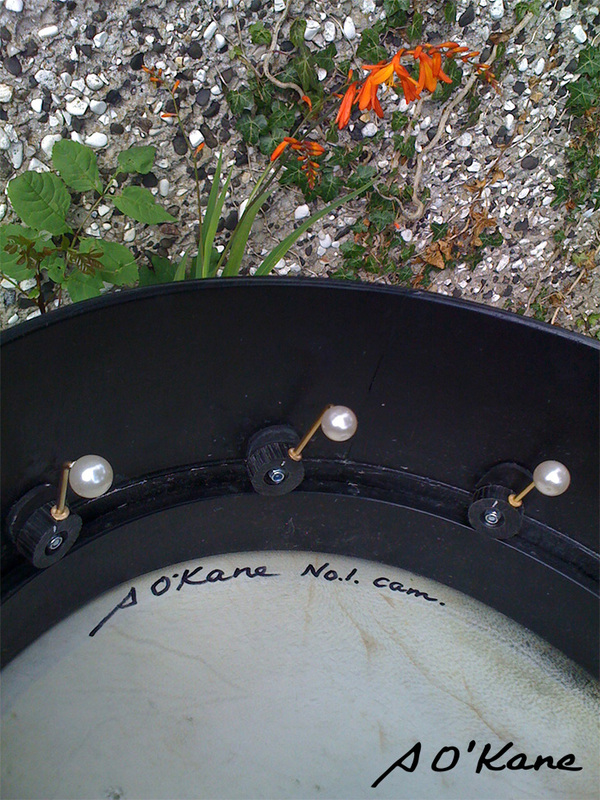 A few years later when Dervish were forming, I made a drum especially for Cathy Jordan so that she would not have to search about for a screwdriver. 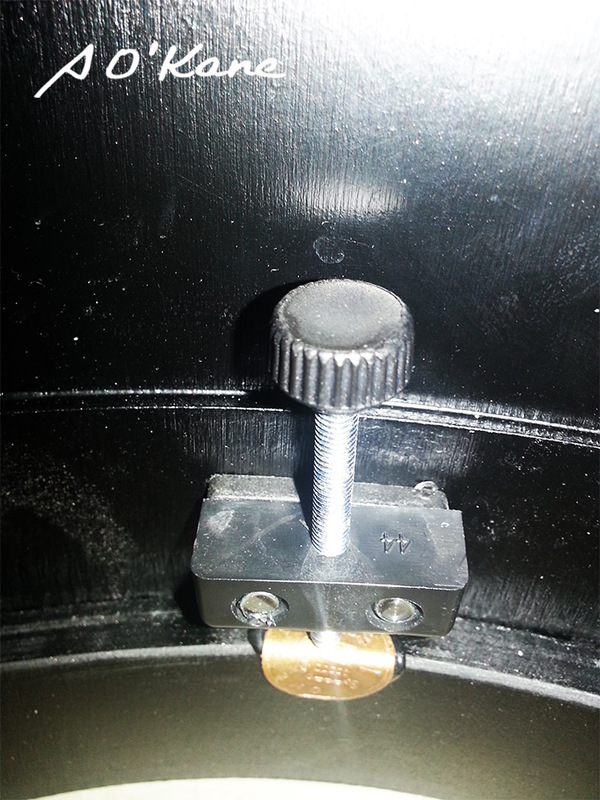 As can be seen in the photo the screw and block is replaced by a plywood cam. The tuning range was relatively small and the wood against wood proceed a burnished shiny surface that tended to backslide. As a friend decided that he wanted to make this type I stepped aside after redesigning it and making a sample for him. He gave up making drums shortly afterwards. At this stage in my life my family were growing up and to pay the bills I had to become much more professional in my approach and make more drums. 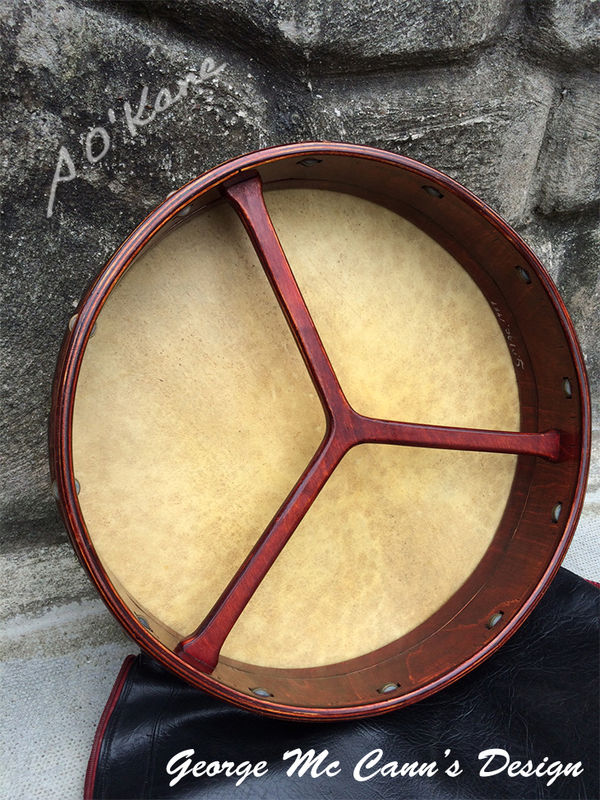 Fortunately there was a change in bodhrán playing technique that suited my drums. 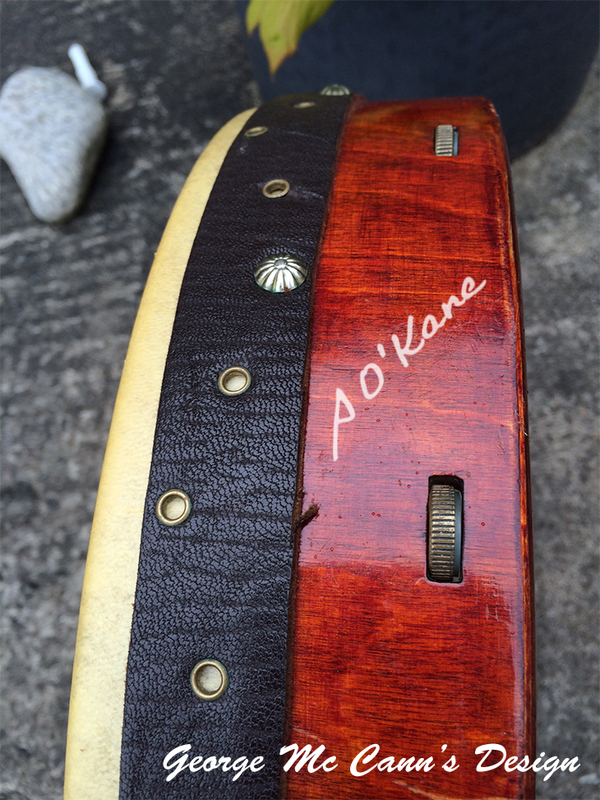 Players like Junior Davey, Ronan Moloney, John Joe Kelly and many others that I have not met were developing new ideas and exploiting sounds that could be found in thinner skins, From these player’s classes emerged students kept on rolling out a new style. Johnny McDonagh put me onto the idea of the electrical tape instead of the duct tape that I had been using. This was the black ring of tape around the outer circumference of the skin to moderate the sound. I have used that ever since, initially telling others that it was for decoration. 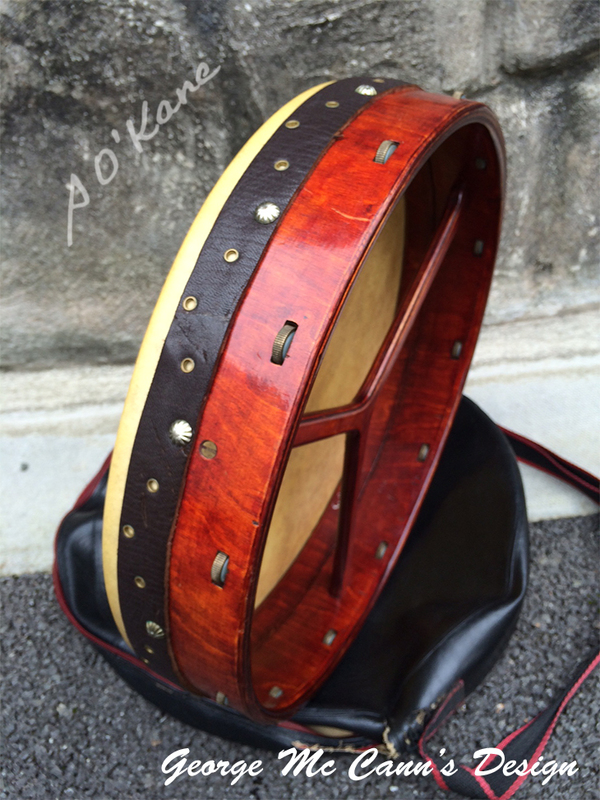 Most makers of this drum type now use this idea. The more traditional makers don’t and use something else. 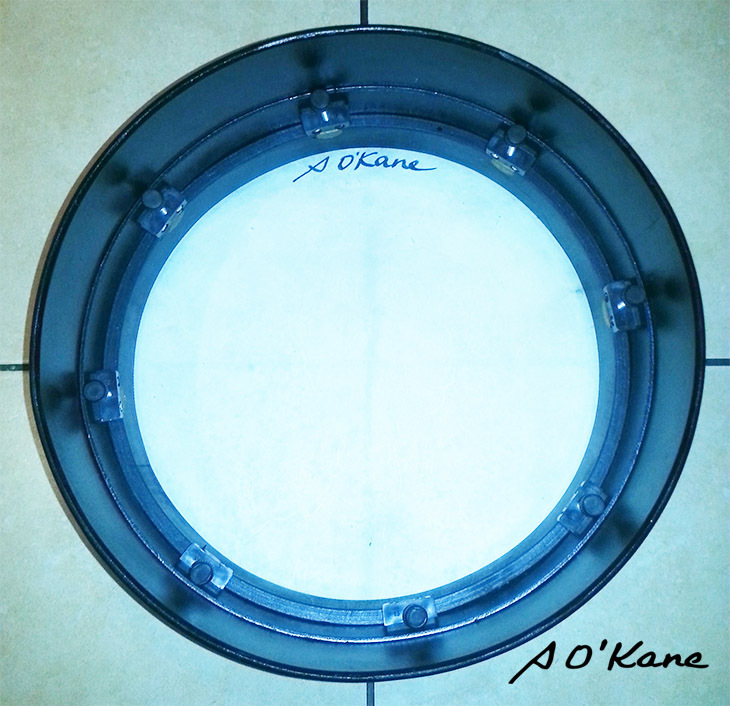 Using other ideas in shell construction and skin treatment, whilst still retaining the old traditional bodhran look , the sound quality and durability of the skin got slightly better... higher highs and lower lows, crisp and clean with no woolly sounds. So the sound of my drums became the standard for drums of this type, but not the sound sought by some other makers who preferred to stick to the older traditional sounds that were more percussive if less musical. 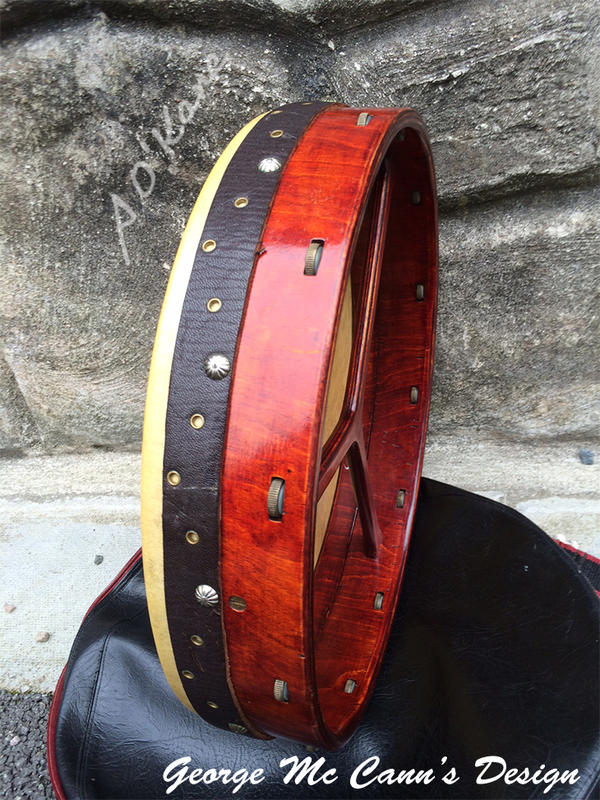 Thus the player now has to choose the style he will play and can buy a drum to suit his choice. There is no right or wrong. It is simply a matter of individual taste. Generally musical drums have the tape of whatever colour, the percussive type do not. (*Note: the Rack and Pinion type tensioning system is no longer available. It was superceded by the Single Point Tensioning system [see: "5. Single Screw – Band Tensioner" system below]). Next I tried to minimise the effort required to tension the skin. Whilst in hospital awaiting an operation to treat a brain tumour I thought up a folding wedge system that was driven by a rack and pinion. The making was too complicated so I abandoned the system. The mechanism is clever but the over engineering was a bit over the top for bodhráns. It is an important invention more suited to heavy duty industrial applications. For a variety of reasons of both usability and sound production it is an improvement on all other systems. However it has its limitations in countries where there is a very wide range of humidity variation. For those conditions I now feel happier to supply the 8 screw type. Increasingly I have noticed that the deeper the shell, the woolier the sound output for players who regularly use amplification. 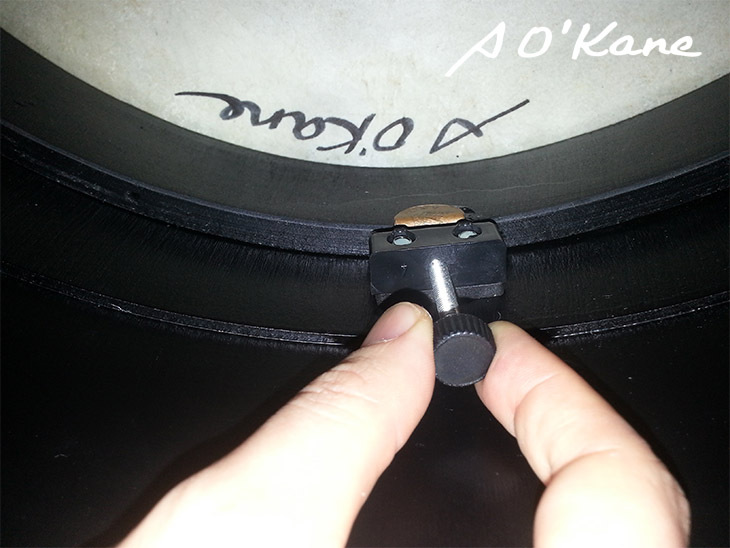 To combat this problem I have been reducing the shell depth by about 1” the effect is that the resonance decreases, the beats more defined and hence the volume can be decreased without loss of drive or increased without distortion. I am now making all my bodhráns between 4.5"s - 6"s depth, on request. In reality the design has changed little since the 2 first tensioning systems. Many ideas that seemed ok at the time have fallen by the wayside or are falling by the wayside. Many design lead wildly away from the design progress. As guidance for young designers / makers and players I feel that players make a choice of drum sounds… one being strongly percussive and usually oiled …the other being less sharply percussive and more musical. These types usually have taped edges. Obviously I have voted with my feet as to which path I prefer…but both have equal importance. The way forward seems inexorably leading to sensitivite playing. The existing problems of over sensitivty to climatic changes has not been answered, particularly for the lambeg style skins with taped edge. David can supply either broken heads or full size skins that are cured, cleaned and stretched. Prices on request.